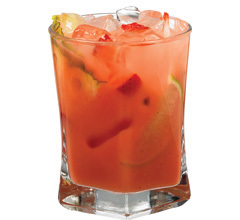 Combine coconut rum, Master of MIxes Strawberry Colada Mix and pineapple juice in a Boston glass filled with ice. Shake and strain into glass filled with ice. Float dark rum over top.